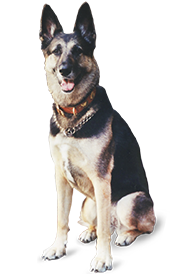 As dogs age, they become more susceptible to age-related diseases such as arthritis. There are many medical treatments that are designed to help you alleviate pain in your dog, but if you want to maximize your pet’s health, it is even more important to take a holistic approach to your dog’s joint health. When treating a dog holistically, it is important that you fist think about the lifestyle changes that you can make to improve your dog’s joint health. This includes making sure that your dog has an active lifestyle and feeding your dog food that is highly nutritious. 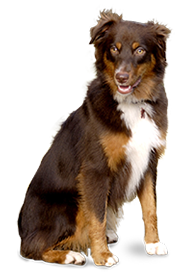 Dog joint supplements can be also effective in treating joint problems. Combine supplementation with a holistic approach to feeding and you will yield even greater long-term results. 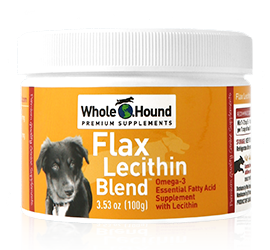 If you are working with a raw food diet and have the time and inclination to go further you might consider natural supplementation like Whole Hound’s Osteo Aid ™ to your dog’s food. Glucosamine is a very common supplement given to dogs, which not only reduces the symptoms of joint pain, but also has been shown to actually protect the joint. It helps the body rebuild cartilage and synovial joint fluid. It may also have preventative benefits against arthritis. Glucosamine and other nutraceuticals can help degraded cartilage rebuild and regain resiliency. 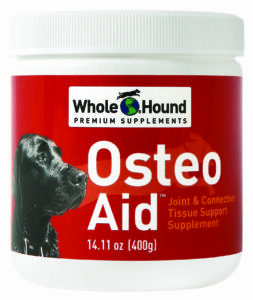 Osteo Aid ™ by Whole Hound is a blend of naturally sourced ingredients which provide the support degraded joints are lacking: Glucosamine, MSM, glycine, vitamin C, calcium, and magnesium. These ingredients have been blended and chosen for their high bioavailability and scientifically formulated to be absorbed into your dogs’ joints. Yes, you can supplement naturally but working with science based nutritional blends like Osteo Aid ™ are intended to help restore your dog’s ability to move. Giving the best joint supplements for dogs will never hurt them. However, these supplements will only help your dog feel its best if you take a holistic approach to your dog’s health that promotes joint health and your dog’s overall well-being.